Opening of Regrub in YEG | DSL Inc.
Regrub is a burger joint originating in Calgary with a brand new location just off Whyte Ave. They feature a massive mural of an octopus destroying the city of Edmonton. 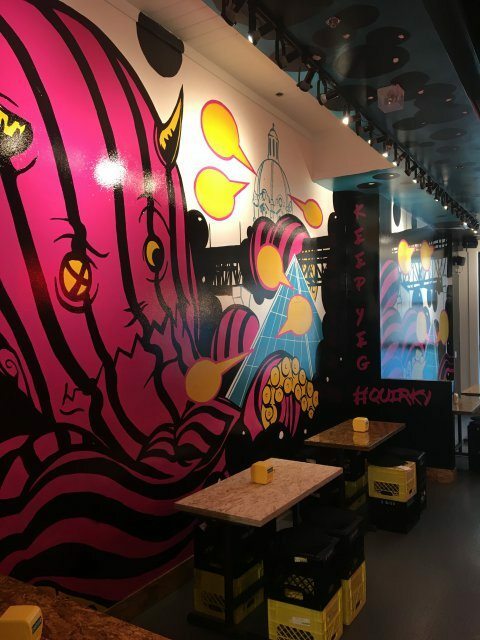 This mural is a representation of their mission: to reinvent how we perceive the classic burger by focusing on food made completely from scratch and sourcing local ingredients where possible. What they term as “the new old-school burger”. What’s unique is RE:GRUBs strong social media presence and extremely creative displays of food. DSL has enabled a large part of this creativity by providing milkshake equipment for all locations. With these extravagant milkshakes they make use of things like: candy lego bricks, moustaches, cotton candy and edible googly eyes. Stop by the Edmonton location and you’ll be standing on a floor of 3500 nickels while you wait to be seated. Check out @regrub_love to see what the hype is about and see a customer DSL can be proud of!